Give the Commission your views on EU lobbying! The European Commission is consulting on lobby transparency until 31 May 2016. Make sure you tell them what you think; this ALTER-EU template provides some food for thought. Read more about Give the Commission your views on EU lobbying! New lobby register consultation: Will the Commission finally grasp the lobbying bull by the horns? 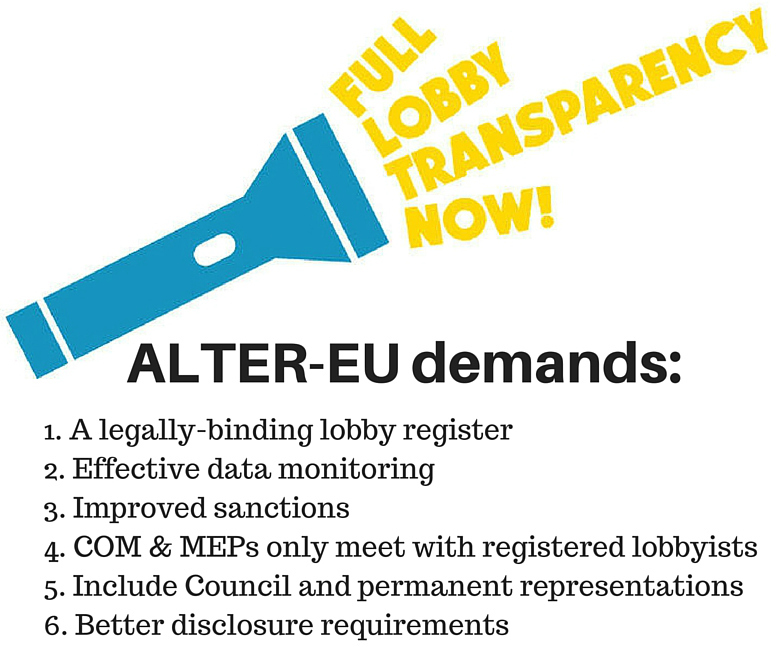 As the European Commission launches its public consultation on the future EU lobby transparency regime, the Alliance for Lobbying Transparency and Ethics Regulation (ALTER-EU) makes the following immediate reaction. Read more about New lobby register consultation: Will the Commission finally grasp the lobbying bull by the horns? Research by ALTER-EU member groups Corporate Europe Observatory, Access Info Europe and Friends of the Earth Europe shows that well over 90 per cent of meetings between DG FISMA (the Commission's department for financial regulation) officials not covered by transparency rules and lobbyists are with the corporate sector. The recent VW scandal makes it very clear that we need a fundamental re-think about the way in which European institutions, especially the Commission, engage with the car industry and corporate lobby interests. Is the Commission reporting on all lobby meetings held by high level officials? Is the Commission publishing all lobby meetings held by high level officials? ALTER-EU writes to Commission Vice President Frans Timmermans to find out. Read more about Is the Commission reporting on all lobby meetings held by high level officials? After ALTER-EU submitted five complaints to the EU lobby register secretariat, we explain why we are disappointed with the reply.